Scientists have found a trio of baby planets using a new technique of spotting unusual gas motion around developing stars. The new technique described in a pair of papers in the Astrophysical Journal Letters. It’s the first time it’s been used to find planets and has spotted three around the newborn star codenamed HD163296. Two independent teams of astronomers analysed radio data gathered from the observations of the star using the Atacama Large Millimeter/submillimeter Array (ALMA), a series of telescopes in Chile. HD 163296 is about four million years old and is 330 light-years from Earth in the direction of the constellation Sagittarius. Most exoplanets are detected using the transit method. It measures a star’s brightness and looks out for the characteristic dip when a planet crosses its path and blocks out its light. Although it has been very successful at uncovering thousands of new exoplanets, it cannot be used to find ones around protostars. Protostars are young stars that have yet to reach the main sequence stage like our Sun. They are surrounded by a swirling disk of gas and dust, hiding objects like baby planets and making it difficult for scientists to study how planetary systems form. The team looked at the motion of carbon monoxide particles in the protostar disk that emit a distinctive wavelength that ALMA can detect. The gas rotates at about 5 kilometers per second, and ALMA could measure the changes in the velocity of the particles to as small as a few meters per second. “We see regions rotating slower and faster than you would expect for gas simply orbiting a star following Kepler's law. The only way to create such significant changes in velocity are due to significant changes in the pressure of the gas as this supports the gas against the gravity of the star,” Richard Teague, principal author of one of the papers and an astronomer from the University of Michigan told The Register. “A planet is able to cause such significant changes in density as it carves out a gap in the disk. We can tell it's a planet because we can use the changes in velocity to trace the shape of the gap which is carved and then match this to large numerical simulations." Jaehan Bae, co-author of the paper and a PhD student at the Carnegie Institution for Science, compared the gaps in the protostar disk and the wake patterns produced by the planets moving through it to the same patterns created when a boat moves through a lake. An image taken from the ALMA dataset displaying a clear gap for the young planet detected at about 260 AU from the star. 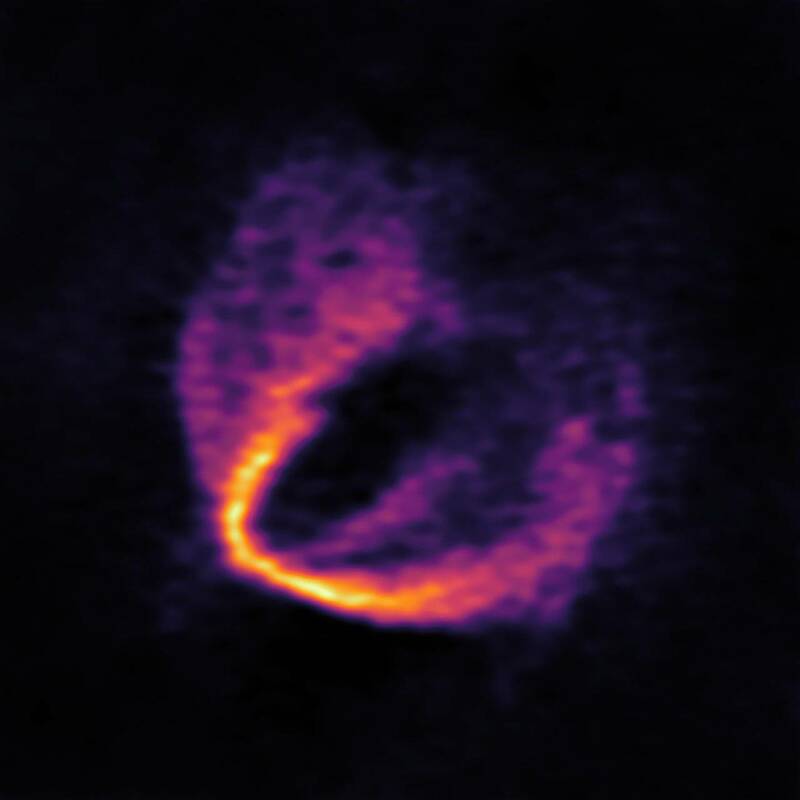 Image credit: ESO, ALMA (ESO/NAOJ/NRAO); Pinte et al. “When a planet forms in a protoplanetary disk it can carve a gap and produce wakes in the disk. So in the boat wake analogy, we observed the gap and wakes in a lake - but not the boat itself - and predicted that there should be a boat in the lake,” Bae told us. The team led by Teague found two gaps and wake patterns associated with planets about 80 and 140 astronomical units from HD 163296. The other research group led by Christophe Pinte, an astronomer at Monash University found the third planet at about 260 astronomical units from the star. All three planets have a similar mass to Jupiter. “A planet will open a gap only if they are sufficiently massive. Similarly, the more massive a planet is, the stronger wakes will it produce. Jupiter-mass planets are known to be massive enough to open observable gaps, whereas Earth-mass planets are too small in mass and they won't be able to clear its orbit. Earth-mass planets will be like a small fish swimming in a lake for which we don't expect to see gaps or wakes,” Bae explained. Both teams hope that the technique will help scientists find the youngest planets in our Milky Way.